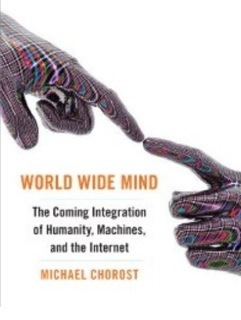 In Michael Chorost’s “World Wide Mind” he explores the exciting opportunities that the currentadvances of internet, neuroscience, and genetics are making possible. Chorost, inspired by his own experience receiving a cochlear implant, is fascinated with the idea of using technology to supplement experiences and allow new forms of communication between networked minds. This book is a great blending of personal experiences, scientific discovery, and imagination. The possibilities that are beginning to come to light are both exciting as well as intimidating as we imagine a world where you can connect your brain with others and “see” and “feel” other people’s thoughts and emotions. One of the personal experiences Chorost describes throughout the book is his year long professorship at Gallaudet, an all deaf school in Washington, DC. Having never learned sign language and the cochlear implant device assisting his hearing, the university wanted his unique perspective on how they can remain relevant. Gallaudet has seen dramatic decreases in enrollment in recent years due to the advancement of technologies that allow the deaf to effectively communicate with people that don’t know sign language and are now attending other universities. The interesting aspect of this is the reality that sign language is being learned by fewer people than ever before. There have been and probably will still be some very long debates about how this is going to play out for the deaf community and supporting educational institutions. The fact remains however, that technology is putting into question the relevance of a language that only ten years ago would seem to be an essential part of life skills for a significant portion of the US population. This scenario makes me think of the argument that a teacher doesn’t need to teach with technology. They can teach the skills they’ve always taught without it, therefore they should be allowed to get by. I think this is a similar argument some professors may be using about their relevance at Gallaudet. New technologies will come that supplant skills that were once essential. So do we minimize, devalue, and simply ignore technologies that make seeming essential skills obsolete? This seems to be the common approach. The problem lies in that great educators are not necessarily simply excited about teaching anything. They have a particular interest. A subject that they are particularly skilled and willing to spend much more time focused on it than most people would. The issue is what do we do when the skills utilized for our interests are better suited for a new technology? What do we do when what we value doing the most, a computer can do more efficiently? I don’t believe that computers will replace teachers. I do believe that technologies will rearrange and prioritize skills and learning objectives faster and more vast than ever before. The issues faced at Gallaudet are no different than any educational institution. As technology advances, educational institutions have to determine how they will remain relevant. There may be a good case for a particular approach to teaching and learning the content that has been taught for the last 50 years, but it all needs to be discussed and justified in order to find a place for it in the curriculum. This entry was posted in Changes in Technology and tagged Adapt, Book, Review, Skills. Bookmark the permalink.